There is an old joke that God created the heavens and the earth out of necessity but that when he created peanut butter, he was showing off. I have often thought the same could be applied to coffee and have theorized that when the Almighty finished with creation, the Lord needed a pick-me-up, and thus coffee came into existence. I, of course, am a coffee addict. I freely admit this, publicly, here and now and have loved this savory elixir since I was 7 years old. Yes, I know the old rule that children should never be given coffee to drink and for this reason, kids are made to believe that coffee is only for adults. In some cases, that would be true because some children are hyperactive and don’t need the caffeine or any other stimulants for that matter, yet we freely give children Coca-Cola, Pepsi, and Mountain Dew, all of which have caffeine, or Kool Aid which is full of sugar…so what’s the big deal about coffee? My Aunt Marilyn, who taught me in the second and third grade, used to bring a large thermos of coffee to school and would drink it during our reading time. I used to love the aroma when she would crack open the handy cup-lid of her red plaid thermos (I was usually sitting in the front row with the other miscreants so I always got a whiff of it when she opened it up) and in my way of thinking, anything that smelled that good had to taste as good as it smelled but when she let me have a small sip once, I found it very bitter and not at all what I was expecting….still, I loved the aroma of it and maybe she just didn’t have the right kind of coffee or something? Now this made me pause and think for a minute….Aunt Marilyn had never put anything in her coffee and she always drank it black. I’m pretty sure Aunt Jean may have too so the idea of putting something in the coffee was new to me…. so I said “I don’t know”. She laughed and said that a lot of people put cream or sugar in coffee or both and that it made it taste a lot sweeter. She decided I didn’t need black coffee so she told me to pick a mug from the collection (I picked the one with the Dixie flag on it because it was colorful) and she went on to make me my very first cup of coffee. When she put it on the table in front of me, I noticed it was now a warm brown color rather than the black coffee I had always seen. She also had put enough cream in it that it was not terribly hot so I took my first sip of it and experienced coffee for the first time the way that my palate was meant to taste it….rich, bold, flavorful….it was a taste that bordered on the divine and for the next half hour, my 38 year old aunt sat with her 7 year old nephew and we had coffee and conversation. That became our “thing”, something we shared together when I came to visit. Twenty-four years later, while visiting my cousin in Huntsville, I met Aunt Jean for lunch at the Olive Garden and after lunch, I told her we had to order a cup of coffee as it was a tradition and so we enjoyed a hot cup of coffee together just as we always had. Both of my grandfathers drank coffee. My grandfather Caston liked his black, made from a coffee brewing machine at his restaurant. He would finish his morning routine at the restaurant, then pour himself a hot mug of coffee and sit at “his” table, usually with a couple of regulars that stopped in for coffee on their way to work. His barbecue restaurant didn’t serve breakfast but they always had hot coffee for anyone that needed a cup on their way to somewhere. He frowned on me drinking coffee as a young teenager (this was before Starbucks made it ok for teens to drink it) but he never outright forbade me from drinking it. My grandfather Brewer enjoyed Maxwell House instant coffee. He would put the coffee mix into a cup and pour his milk and sugar into the cup, then add hot water from a whistling kettle, pouring until the cup overflowed into the saucer. He would sip his coffee from the saucer and then drink it from his cup afterwards. I never saw him use a coffee mug-only a cup and saucer. My mother introduced me to the best way to make coffee. In the 70’s, she had a large stainless steel percolator with the glass dome on the lid. As the coffee made, you could see the hot, black coffee shooting up into the glass dome, then fall back into the container, over and over until it was done. She gave me this old percolator when I moved out and I used it for years until the power cord was lost in a move. Percolator coffee, to me anyway, is always better than brewed coffee in a filter pot and I decided to find a new percolator to make coffee in for the house. I enjoy the sound it makes and the aromas of the coffee when it is making, hot steam coming out of the spout. My father-in-law helped me make the transition from store bought grounds to whole bean coffee about 15 years ago. He is also a coffee addict and he enjoys trying exotic gourmet coffees from different parts of the world, made easy now by the various coffee delivery services that have sprung up in the last two decades. As good as ground coffee is, whole bean coffee that you grind your own self and immediately percolate is so much better. Then the Keurig came along. I had heard about them, seen them occasionally, but had never used one before until we went by one of my favorite stores in Macon that had one. After I saw how it worked and how easy it was to make a single cup and not waste any, it went on my Christmas list. We wore that one out in about 3 years and are now well into wearing out our second one. I prefer the “Chock Full O Nuts” brand K-cups because they are available in Jackson, they use less plastic than other k-cups, you get 20 for $10.00 with an Ingles Advantage Card and the coffee is just plain good. I even bought a Keurig for my office. Over the years, I have drank all kinds of coffee….good coffee, bad coffee, something that was supposed to be coffee (and I still haven’t figured out what it was), truly wonderful coffee, instant, brewed, percolated…..I even had a science teacher in high school who made her coffee by heating up water in a beaker over a Bunsen burner and pouring it into her instant coffee mix. There are many innovative ways to prepare and make coffee and no one way is better than another…just like barbecue, each way is the best to the person making it. Coffee is a part of the traditions of many people also…coffee after dinner, meeting over a cup of coffee….and sometimes, if you have a busy week and you need to get 15 minutes in with someone, meeting over a cup of coffee is just the ticket. 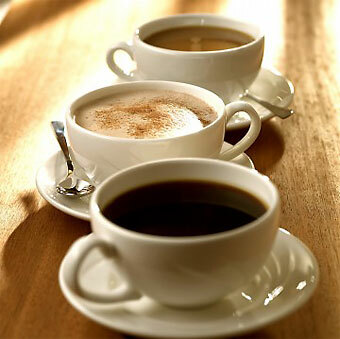 I have enjoyed many of the “meetings” I have had over coffee….business meetings, social meetings, family time even. Throughout the world, how many of life’s problems have been discussed and sometimes settled over a good cup of coffee shared by two people at a corner table? For me, I can smell a pot of coffee brewing and it makes me think of different things…..like Aunt Jean and all her coffee mugs, or waiting into the late hours of the night for my son to be born when the coffee was the only thing keeping me alert….or that wonderful coffee they served at the Greenbrier on my honeymoon….or watching my grandpa drink coffee from a saucer without spilling a drop. I find it amazing that something as innocuous as coffee can be such an integral part of so many people’s lives, yet is always such a bit player with a background role on the stage of life. I think the only time that coffee ever got its 15 minutes of fame was when the McDonald’s customer spilled it on themselves and sued McDonalds for having hot coffee! To me, that is the only way to drink it and despite all the dire warnings that the beverage you are about to drink is hot, I think I will take that risk and continue to enjoy one of life’s true indulgences….cream and sugar optional. My parents always have a pot of coffee on. Always have. I know if I stop by, I can get a cup. They just brew Maxwell House French roast, and have for 20 years, but somehow it’s always very good. My first wife swore by the percolator, too. It was good, but I had equally good drip coffee here and there. My now-wife bought me a Chemex two years ago and it brews the best coffee I’ve ever made at home. I buy whole-bean coffee when I can. My two favorites are Peet’s house roast and Trader Joe’s Columbian Supremo. But the best coffee I’ve ever had is at this little Italian restaurant here in Indy. Dark black yet surprisingly mild and nutty, and naturally sweet. I’d eat there more often and have their coffee were it not for my pesky difficulties with garlic and onions. Love me some coffee! Also love to hear stories about grandma Jean. Thanks for sharing!